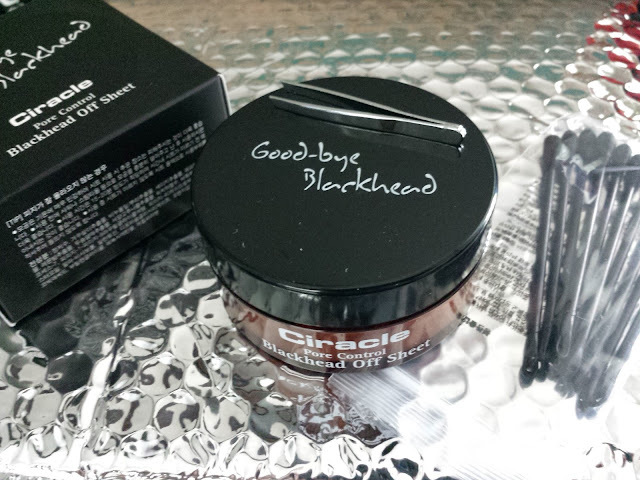 Pint-sized and Simple: Kiss Those Blackheads Goodbye With Ciracle Blackhead Off Sheets! 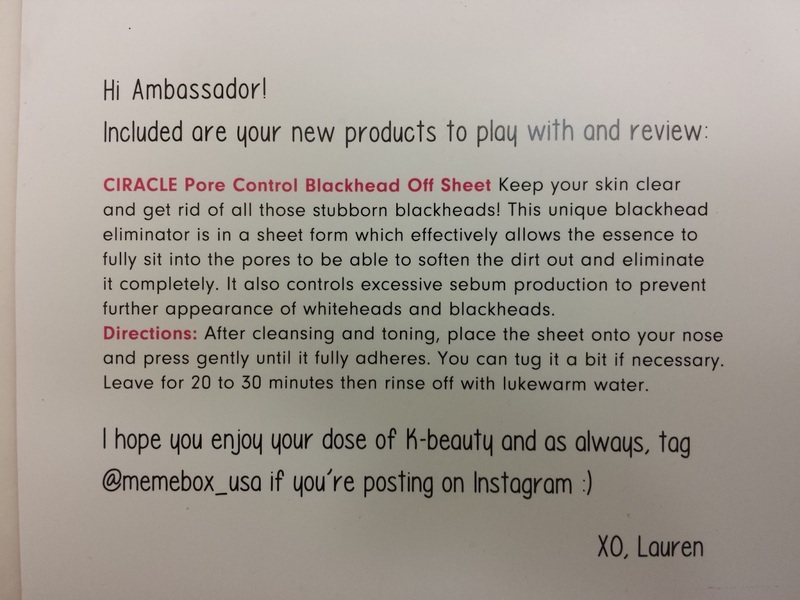 Kiss Those Blackheads Goodbye With Ciracle Blackhead Off Sheets! 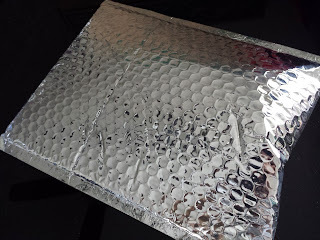 These silver envelopes from Memebox are probably my favorite thing to see in the mail because it means I get something new to add to my beauty or skincare regimen. This time around I'm gonna try Ciracle's Blackhead Off Sheets. 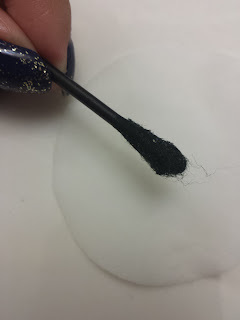 I have huge pores that love to collect dirt so blackheads are a regular thing for me. I've tried almost every blackhead removal tool/cream/gel I've come across and the only one that's worked was Purederm's blackhead strips (nope, not even Biore worked). I'm always on the lookout for other blackhead remedies so this is probably the most excited I've gotten in a while. You know your life is pretty boring when you get ecstatic over blackheads. Pretty soothing stuff. 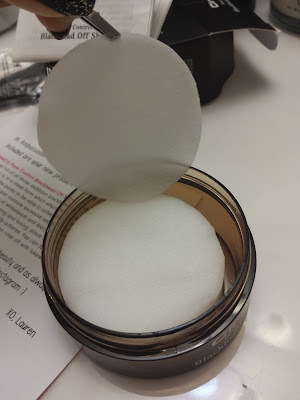 It also came with some cotton swabs with a blackhead tool on the other end. Is that plastic flimsy thing supposed to work on my blackheads?! Or maybe my face is just really stubborn and likes to hold on tight to its blemishes. I wouldn't be surprised. Anyway. One of the best parts about this product is that THERE ARE ENGLISH INSTRUCTIONS! Happy dance! But just in case I was one of those who those people who like to throw away instruction bookets, Memebox was nice enough to include an instruction card as well. There are a couple of differences between the instructions, though. Ciracle tells you to leave the pad on for 15 min while Memebox says 20-30 min. 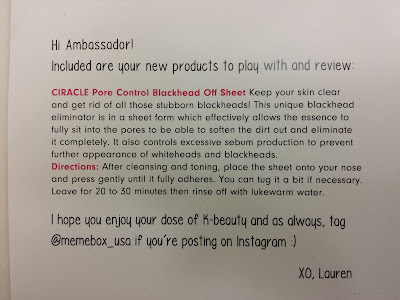 Also, Ciracle instructs you to wipe the blackhead residue off your face before rinsing; Memebox just says to remove the pad and rinse. I decided to try it both ways and compare the results. The pads itself look just like Stridex pads minus the texture. There's a citrus scent to it, nothing offensive at all. 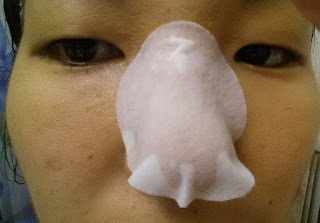 You slap the pad on a cleansed and toned nose and wait. Excuse my face. I never know where to look when taking selfies. As I mentioned I tried it using both instructions and found I preferred Ciracle's directions. Here's the Q-tip after swabbing my nose. I was hoping it'd be covered in dead skin and yuck, but there were only a few remnants here and there. But my nose told a whole 'nother story. It was SO SMOOOOTH! Just like how it felt after the Purederm strips. 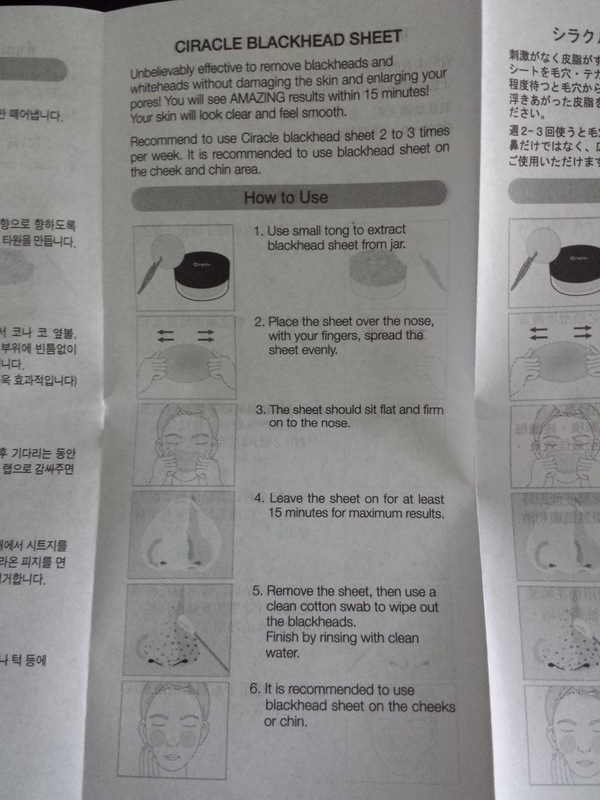 The instructions say to use this treatment twice a week to keep your nose free of blackheads and I think that's about right. About three days after I used the blackhead sheet I started feeling little bumpies on my nose again. However, like anything else, this miracle sheet isn't all rainbows and glitter. 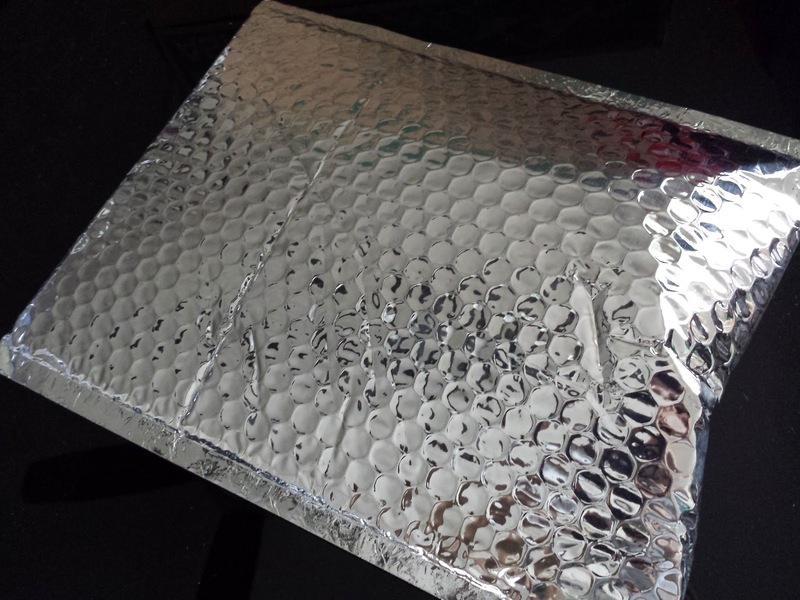 If you have sensitive skin you might want to consider using these blackhead sheets just once per week week and/or keeping it on for no longer than 10 minutes. My skin isn't especially sensitive, but after two applications the area on the sides of my nose where the pad touched got really itchy and broke out in hives. It lasted for only a day but it was still pretty uncomfortable. My nose itself loved it though, so if worse comes to worse I'd suggest trimming the sides of the pad to fit only on your nose. The instructions suggest using these sheets on your cheeks as well, but obviously I wouldn't recommend that unless your skin is tough as nails. Overall though, fantastic product and I will definitely continue using this one! I have these and like them! It took me awhile to figure out that I was supposed to stretch them out in order to get around my entire nose. Whoops. Haha! All those acids are good at taking the top layer of your skin off, that's for sure. Mmm, shiny, clean noses!